From Wikipedia: Virtualization, in computing, refers to the act of creating a virtual (rather than actual) version of something, including but not limited to a virtual computer hardware platform, operating system (OS), storage device, or computer network resources. Today we’re encountering virtualization in most of our computing environments. It provides valuable benefits for software development where one can isolate completely the runtime environment, thus keeping the host machine intact. In the web development world, virtualization is a “must-have” which enables companies to optimize server operation costs. Unix (and *nix systems alike) does not strongly implement the principle of least privileged and the least common mechanism principle; most objects in Unix (including the processes) the file system, and the network stack are globally visible to all. This leads to a lack of configuration isolation: multiple applications can have conflicting requirements for system-wide configuration settings, or different versions of the same library (which is more problematic). Therefore a need to run these applications in separate environments arises. In the current paper we would like to discuss about a different kind of virtualization: operating system level or container-based virtualization. In contrast with full hardware virtualization (like VMware ESXi, or QEMU), OS-level virtualization comes with lighter overhead compared with full hardware virtualization. Guests which are implemented as OS-level virtualized are also named containers – the community has taken this name and used it as container-based virtualization. Recently, Docker has come to our attention because of the way it augments this type of container based virtualization, introducing some useful novelty concepts like descriptive configuration files and the possibility to commit one’s updates on a container.Our main goal was to mimic as much as possible the “classical” setup of a web application deployment environment where we have separate server containers for the application server and the database server. Taking this concept one step further, we can integrate a load balancer and a second application server. Linux containers – how they work? – adding new access control checks to every syscall. Thus Linux containers can be seen as another level of access control besides the users and groups-based access control. Linux container is a concept built on the kernel namespaces feature, which we try to describe below. As we can see, the most important system resources are being wrapped so that a Linux container “thinks” it owns all the system resources. The common setup implies a fully isolated container, which has no access to resources outside of the container. A process which runs inside the container will appear to run inside a normal Linux system, although the kernel is shared with processes located in different namespaces. In contrast with a VM, a container can hold only one process. A container which has all the processes of a full system is called a system container, while a container with one application only is called an application container. It is most convenient to share resources with the hosting system in case total isolation isn’t a requirement, for example bind mounts for shared storage; in case of a VM, the storage can be mounted only via NFS or SMB shares, adding an extra layer of indirection. Having namespaces for system resources make security simpler: a container cannot access what it cannot see. Additionally, the root user from within the container is considered different thant the root user of the host. The main security bridge can come from system calls which aren’t namespace-aware. The system calls are still being audited for such cases. These are the building-blocks for all Linux container-based virtualization providers; on top of this, container providers deploy high-level tools for managing containers and their images: creating, running, stopping, linking them, etc. Docker, OpenVZ, LSX – all of them are built on top of the kernel namespaces feature. Due to its feature set, Docker is probably the best management tool for containers. Our goal is to reproduce the environment in which a certain application runs: servers and their configuration, the links between them and a shared application configuration. In other words, from the application’s point of view the VE should look the same (in terms of configuration) as the real (let’s say production) environment. – QA to simplify integration testing, especially for those cases where the application uses external services: they have their own version (which may not be yet in production), you want to test with real data, but not especially with the real environment, etc. – devops to have a single setup which can be replicated on any host machine. – a PostgreSQL server, which has a sample DB set up (called ‘skel’ – from skeleton)- contains 2 tables: users and companies pre-populated with some dummy data. If stations are accessed via these ports, the load balancer is short-circuited; this is also useful if one wants to interact with a specific web server, instead of passing through the load-balancer. – this works because if startup.sh fails, the container simply does not start. – modify the launch script by adding one / multiple containers of that image in the cluster of your choice. – optional: modify the network address of example.com and the gateway; by default, all the stations inside a domain can run inside the same network (see the picture above): all stations are linked by a virtual switch (brctl) and have one default gateway (which may also play the role of load-balancer). It is also possible to have the stations inside a domain split into multiple networks: just create as many clusters as network addresses and assign the desired container to the desired cluster. That’s all. – star topology at the cluster level: all the clusters are linked by the backbone container, which assures the OSI layer 3 connectivity between any 2 containers inside any two different clusters. – star topology at the container level: all the containers inside a cluster are linked by a virtual switch. We don’t want that. We want to be able to assign any IP (including public IPs) address on any container and have the same application configuration as the one in production. Our solution to this problem is easy: simply use one of the features Docker is built upon: network namespaces. 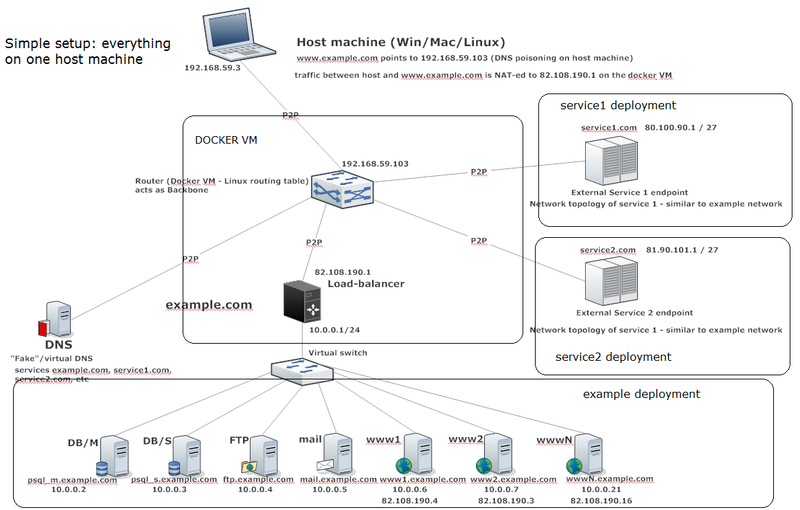 – there is one virtual switch per cluster, and all the containers are linked to it. Then we use the concept of clusters, which is nothing more than a group of containers which are linked in the same virtual switch and share the same network address, and the same default gateway (which is also part of the cluster); a cluster is thus a LAN with a star topology. Then, all the clusters are linked by one container which we call the backbone. The backbone links all the clusters together, acting as an edge router. The backbone also links the clusters to the docker VM, making the communication between host machine and containers possible.The backbone also plays the role of the DNS server in our setup. This creates two clusters: one with tomcat, load-balancer, psql and another one with a single container. It is useful to check the integrity of certain files in your VE: configuration files are one pertinent example. For that, we provide a simple script which calculates the checksum for the files you want to check and another one which checks the integrity of the files when the container starts, and, if the check fails for at least one of them, the container will simply fail to start and the whole launching operation fails. The script logs the files which have a problem in a log file which is in the root apomon directory. It is easy and desirable to modify these scripts for your needs. A real-life scenario would imply that the verification file is stored on some HTTP / S3 / FTP location and the verification script takes that file from there before performing the verification. Not starting the container in case at least one file is corrupt is achieved by making the container run the startup.sh script and by making that script fail in case some file is corrupt. In case startup.sh fails, the container will simply not start.